The Haganah (defense) was one of several military groups formed by Jews in Palestine during the British Mandatory period. These groups initially served to defend rural Jews from attack by local Arab forces. They also played a major role in opposing British rule in the years immediately preceding the founding of the State of Israel in 1948. The Haganah sought and received broad support and funding from sympathetic Jews around the world. 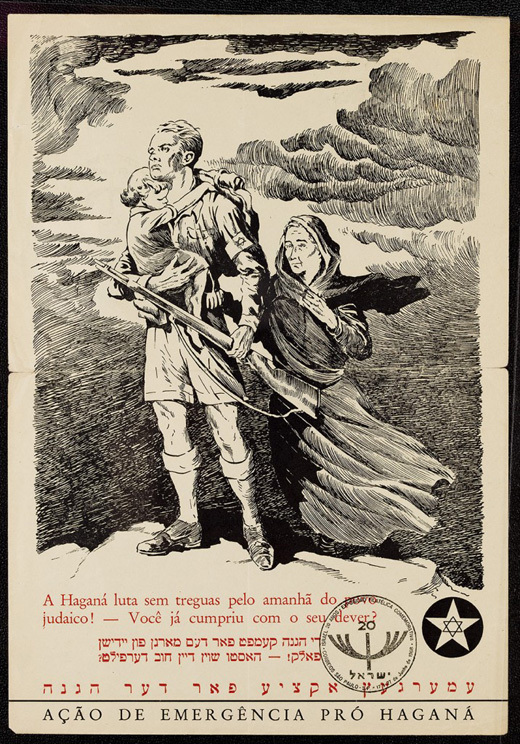 Translation from Portuguese and Yiddish: The Haganah struggles relentlessly for a tomorrow for the Jewish people. Have you fulfilled your duty yet?